Pro gamer Johnathan ‘Fatal1ty’ Wendel has confessed that the main reason he has stepped away from competition is that there just isn’t a game that appeals to him at the moment. “Right now I’m waiting for the right tournament and the right game to come back and play," Fatal1ty told TechRadar at the launch of Creative's Xfi Titanium Fatal1ty range. “I don’t think there are any games that are right for me, right now. To want to jump back in competitively I need the right game and I don’t think that game is there. “I think there’s a lot more than twitchy [reaction and aim] skills – they are important – but there is things like gameplans and strategy as well. “If you are a pro you put in the amount of time to build that skillset, whereas now you can pretty much pick up the controller and drop right into the latest games and be as good as the guy next to you pretty quickly. “It’s great that it makes it more accessible but when it gets to professional gaming you have to have that quality that means that the best players are better than those below. 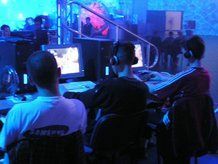 “You take something like Quake III or Painkiller and the difference between the top three of four and the rest in the top eight is obvious – and that is rewarding. Wendel insists that his reticence to compete is nothing to do with a perceived decline in PC gaming, and he believes that the platform will bounce back even stronger in the coming months. “The PC is very strong and it will continue to grow and get even better,” he insists. “There are a couple of inventions that are going to change PC gaming coming up and I think it is going to be blowing people’s minds and make people want to play. Wendel believes that people will begin to clamour for a game that rewards practice rather than simply makes it easy to become competitive.